Well, it’s Saturday and I am bemired in the early hours of the morning. The first day of the second cricket test between Bangladesh and the Black Caps has been abandoned, so I’m left to the rain and the sounds of a not-quite asleep city as I put together a power point presentation on New Atheism. Anyway, a few items of interest from the intraverse. Comedian, now cantankerous political critic? John Cleese on why America needs to vote for Barack Obama and Sarah Palin’s ornithological parallels. A new Stargate splinter series, Stargate Universe focuses on a new crew, quest and setting. This time a group of explorers gate onto an Ancient ship, Destiny, and cannot return to Earth. More details and concept art on the SciFi.com site. This is absolutely brillant. Viral marketing has began for Gentlemen Broncos, the new film from Napoleon Dynamiter, Jared Hess. 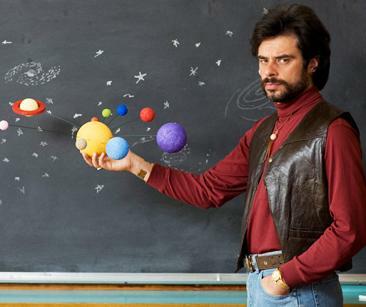 Fox searchlight has set up a website about one of the central characters from the movie, a Dr Ronald Chevalier – played by our very own Jemaine Clement (from the Flight of the Conchords). There are two videos, one on inspiration and the other on the art of relaxating. Celestially classic. AOL asks where the cast of Buffy are now? CT referees, and adjudges it: Fireproof 1, Religulous 0. Really, they’re apples and oranges but for those that are counting, Fireproof has made 21 million and Bill Maher’s doco has pulled 9 million. Iron Man concept art from the special features of the now-released DVD. Though long rumoured, BioWare finally annouced its plans for a Star Wars MMO. As a Star Wars Galaxies junkie and big fan of BioWares original rpgs this should have been big for me. 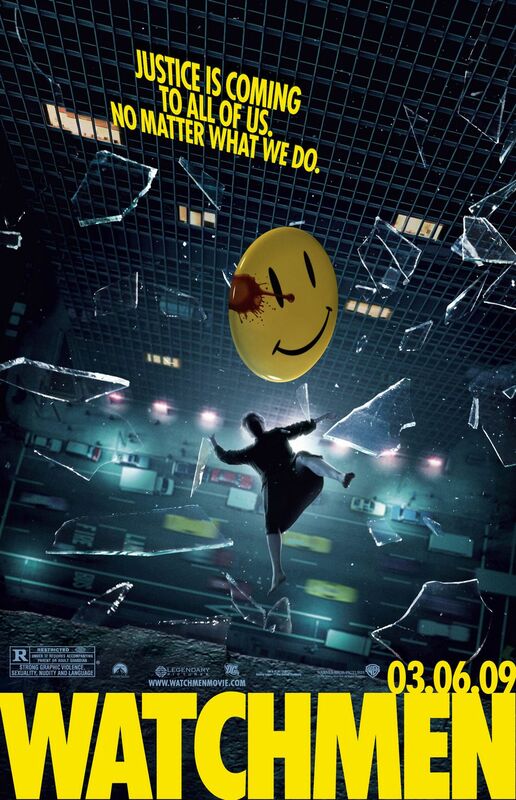 Yet, the art direction on this seems massively skewed to a WOW-clone. I’ll be watching, albeit circumspectly. Some new books out next week: Keller’s The Prodigal God (he talks about it here) and Sproul’s childrens book: The Prince’s Posioned Cup (you can read Sproul interviewed about the book here). 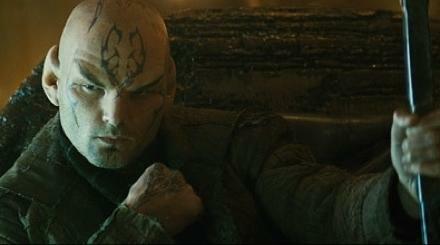 Paramount Pictures has been disseminating new pics from the new J J Abrams directed Star Trek film. I have to say, I’m digging the new look. “All my smart friends liked Star Trek,” [Abrams] says. ”I preferred a more visceral experience…that grabbed me the way Star Wars did.” That meant a bigger budget and better special effects than any previous Trek film, plus freedom to reinvent the mythos as needed. With my allegience firmly tied to Lucas’ scifi vision over Rodenberry’s, I can’t let this go: the new director responsible for the rejuvenation of the future of the Trek franchise enjoyed Star Wars more? Hurt, much? 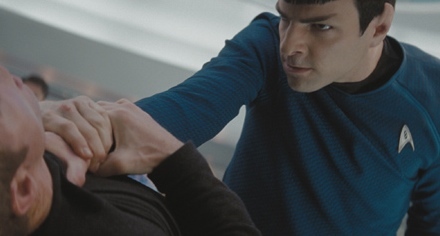 Although the plot details are still skeletal, what we do know is that the film weaves the origins of the crew of the Enterprise, showing how Kirk and Spock came to be friends. 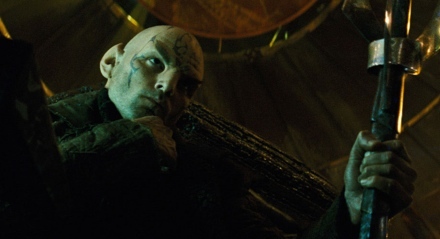 Also, that there is an attack on the USS Kelvin by the Romulan villain known as Nero (played by Eric Bana), hunting one of the film’s central characters (see the pics of the damaged Starship). I wonder if this attack my coincide with the rumours that there may be a time travel aspect to the story. 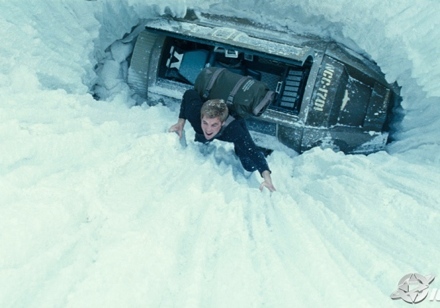 A second full trailer will be attached to the Bond film, Quantum of Solace, which is released on November 14. Photos courtesy of MTV, UGO, Ain’t it Cool News, Yahoo, SlashFilm, IGN, JoBlo, and TrekMovie. I’ve been discussing inerrancy with a friend and particularly what view Jesus held about the inspiration of the Old Testament in the context of Matthew 5:17-20. There is a compelling argument to adopt a high view of the trustworthiness of the Bible from the statements Jesus made about the Old Testament. However, I do not believe that this is the primary grounds by which we come to accept the the authority of Scripture. Therefore, before I make a stab at exegeting the Matthew passage and its implications, I wanted to first set out some preliminary thoughts on how it is we do come to trust the Bible. We are all confronted with the issue of authority. Bumper-stickers might protest otherwise, but each one of us must assess and ultimately decide which source of authority to rest our confidence in. We may come to believe things on the basis of our own experience, but many facts about the world lie beyond the reach of our own investigation. This is the connection between trust and authority that Augustine, the yoda of medieval theology, elucidated. When we cannot know if something is true on the basis of our set of perceptions of the world, we must believe the testimony of others. So for Augustine, faith is ultimately grounded in an authority, where things that are not directly or immediately known are adopted on the basis of an authentic or authoritative testimony. For most Christians, the Bible functions as the supreme locus of authority. Because Scripture reveals the mind and will of God, it therefore claims this principal role in the way we come to adjudicate truth. But on what basis do we decide that the Bible should function this way for us? Even Augustine recognized that there are many sources of authority that we have available to us. He suggested that there must be certain signs (indicia) of credibility that evince the perspicuity of an authority to us. How then, do we determine Scripture’s authority? This does not mean that we cannot use external evidence or that there is no place for separate lines of argument for the authority of Scripture. The process by which the Holy Spirit draws us to behold the glory of the Gospel is a rational process and therefore can be defended against objections. We, in fact, should be open to utilise other forms of external data but must realise that these can only support or clarify the original Spirit’s witness. The central foundation for our confidence in the authority of the Bible, just as the salvific apprehension of Christ as the Saviour of the world, however is the sovereign work of God Himself. It’s hard to deny our appetite for the visual. Yet the power of the image to draw out our emotion can in itself be both perilous and propitious. While spectacle can have the ability to circumvent our critical faculties and tyrannize our imagination, the visual also the unique ability to cast open windows into truth with extraordinary immediacy. The efforts of Chris Harrison, a Ph.D student at Carnegie Mellon University, to visually represent the intertextuality of the Bible demonstrates this quite amazingly. Using 63,000 cross references collated by an Evangelical Lutheran Pastor in Germany, Harrison’s visualization received an honourable mention in the National Geographic 2008 International Science and Engineering Visualization Challenge. 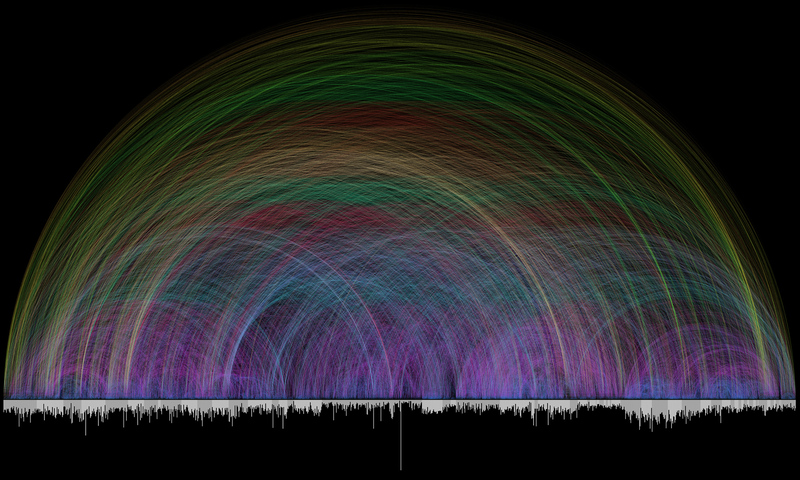 In Harrison’s representation the 1,189 chapters of the Bible are plotted along the horizontal axis at the bottom of the image, with each bar’s length determined by the number of verses. The rainbow arcs above the graph show the cross-references between each chapter. While my flagging internet connection won’t permit me to examine the hi-res version of the multi-coloured arc (it’s weighs in at about 109 MB) , I would be interested in getting a closer look to understand what kind of markers are used to identify the interconnectedness. Still, it’s beautiful. Even for a graph. Click on the picture for the medium sized version and check out this page for his other projects in representing data in equally complex and elegant ways (HT: Claude Mariottini). The September issue of Themelios has a short but typically brilliant editorial by D. A. Carson on distinguishing what is central in the mission and witness of the church. Few theologians today can match Carson in either the proliferation or penetration of his writing; he thinks with the cerebral brawn of a scholar and the sober urgency of a pastor. Carson’s readiness to approach theological conflagrations (from the King James Only debate to the Inclusivist Bible Language debate) and yet adduce restrained, Biblically-grounded answers has shown him to be one of the steadying influences of evangelicalism (a good biography of him can be found here). I know there are countless individuals that I’m sure have benefited from Carson, but I think I can attest to a special indebtedness to his ministry. His book, The Gagging of God, had a profound impact on my faith and particularly in setting me on a course to unravel my theology from the choking tendrils of Derrida and others of the New Hermeneutics/Post-Structuralist bent. And every occasion that he has traveled out to our far-flung set of islands on the lip of the Pacific, I have been both challenged and encouraged. His most recent visit to New Zealand, however, brought particular blessing when it became the setting of my introduction to an amazing woman who now is the joy and treasure of my heart. The focus of Carson’s present efforts is a theological issue that has provoked several wildfires within evangelicalism. Namely, the question of how to frame the Gospel and whether or not to include a social, public aspect in its articulation. For example, the Anglican bishop of Durham and influential theologian, N. T. Wright, in his recent book argues that the church has betrayed an overemphasis on saving souls and failed to acknowledge the imperative of social work. He is dissatisfied with Luther’s justification by faith and maintains that the Gospel instead also represents the anticipation of the transformed and restored world that God will bring about. Wright suggests that our present understanding of the sacred space in which the church operates is too narrow and we must see all of creation as apart of God’s redeemed domain. In Surprised by Hope, he writes: “if it is true that the whole world is now God’s holy land, we must not rest as long as that land is spoiled and defaced. This is not an extra to the church’s mission. It is central.” But what does this mean exactly? For Wright, this imperative must extend to “environmental work, creative and healthy farming methods, … proper use of resources…” and most of important of all – addressing Third World Debt. And Wright is not alone. Scot McKnight, professor of New Testament at North Park University and popular author, also suggests that our understanding of the Gospel is far too small. He says, in focusing on sin as only a judicial failing and confining the mission of the church to personal evangelism we have essentially emasculated the Biblical message. And despite its dissolute, polymorphous nature, one of the most stentorian cries to come out of the emergent movement is a renewed embrace of social justice as integral to the Gospel (when I was thinking about this post, I saw that Christianity Today had done a feature article on Brian McLaren, the emergent church, and grapples with some of this – but really, McLaren deserves separate treatment and a whole other post). Granted that we ought to be engaged in acts of mercy, what safeguards can be set in place so as to minimize the risk that the deeds of mercy will finally swamp the proclamation of the gospel and the passionate desire to see men and women reconciled to God by faith in Christ Jesus and his atoning death and resurrection? First, it is helpful to distinguish between the responsibilities of the church qua church and the responsibilities of Christians. Some writers flip back and forth between references to “Christians” and references to “church” as if there is no difference whatsoever. But many Christian thinkers, from Kuyperians to Baptists, have argued that if the church qua church is responsible for some of these substantial works of mercy, such works of mercy ought to come under the leaders of the church. It is very difficult to find any warrant for that step in the New Testament. Even before there were pastors/elders/overseers, the apostles themselves, according to Acts, recognized that they should not be diverted from the ministry of the Word and prayer, even by the inequities of food distribution among the faithful, so they saw to it that others were appointed to tackle the problem. Ministers of the gospel ought so to be teaching the Bible in all its comprehensiveness that they will be raising up believers with many different avenues of service, but they themselves must not become so embroiled in such multiplying ministries that their ministries of evangelism, Bible teaching, making disciples, instructing, baptizing, and the like, somehow get squeezed to the periphery and take on a purely formal veneer. Second, one pastor astutely urged, “Preach hell.” Two things follow from this. (1) By adopting this priority we remind ourselves that as Christians we desire to relieve all suffering, from the temporal to the eternal. If we do not maintain such a panoramic vision, the relief of immediate suffering, as important as it is, may so command our focus that we fail to remind ourselves of Jesus’ rhetorical question, “What good will it be for you to gain the whole world yet forfeit your soul?” Read the closing lines of Revelation 14 and Revelation 20 when your vision becomes myopic. (2) As long as you are prepared to plead with men and women to be reconciled to God and to flee the coming wrath, you are preserving something that is central in the Bible, something that is intimately and irrefragably tied to the gospel itself—and those who want to shunt such themes aside and focus only on the relief of present suffering will not want to have much to do with you. Thus you will be free to preach and teach the whole counsel of God and to relieve all suffering, temporal and eternal, without being drawn into endless alliances in which people never focus on anything beyond threescore years and ten. Themelios is an international journal apart of the Gospel Coalition’s greater umbrella of efforts to network Reformed pastors and theologians and equip other Christians (I recommend their Christ on Campus Initative, which is directed to resourcing student ministry and engaging apologetic issues).